The Transportation Pooled Fund (TPF) Program allows State departments of transportation (DOTs) and the Federal Highway Administration (FHWA) to create synergy—by leveraging resources, avoiding duplication of effort, and joining forces on planning and research projects of mutual interest. Obtain greater input on project definition. Achieve broader dissemination of results. Address issues of regional and national interest. A State DOT or FHWA must sponsor each TPF project. For a study to qualify for the TPF Program, more than one State transportation agency, Federal agency, other agency (such as a municipality or metropolitan planning organization), university, or private company must find the subject important enough to volunteer funds or other resources to conduct the research, planning, or technology transfer activity. If a subject has been studied before, the proposed study should provide new information that will complement or advance previous investigations of the subject matter. The TPF Program has existed for more than 20 years. Historically, keeping up with TPF projects involving several partners and disseminating information to the partners and other parties have been complicated and time consuming. To make the communication process easier, FHWA held a "Reengineer the TPF Program" workshop for State DOTs in 1999 at the Turner-Fairbank Highway Research Center (TFHRC) in McLean, VA. At the workshop, which focused primarily on improving the administrative efficiency of the program, the idea of an interactive Web site was born. The site was launched in January 2003 at www.pooledfund.org. Accessible to anyone with an interest in pooled fund studies, the site serves as the mechanism by which all project partners can post and update information. Developed under National Cooperative Highway Research Program Project 20-39(2), the site allows for online solicitations of and commitments by prospective partners, and posting of work schedules, progress reports, submittals, and deliverables. It also serves as a tool for tracking implementation activities. When a project is completed, the final report is posted on the site, where it can be transferred electronically to partners and State DOT libraries, as well as to the Transportation Research Information Services and the National Technical Information Service. Site enhancements continue as part of an ongoing effort to improve the efficiency of the TPF Program. The interactive site not only has enhanced communication among TPF Program participants, but it also has allowed researchers to collect information about the program. All 252 projects included at least one State DOT. In addition, all 50 States, along with the District of Columbia and Puerto Rico, were involved in at least one project. Thirty-six different States were the lead partner on one or more projects. TPF projects ranged widely in scope. In dollar terms, projects ranged from $100,000 to $3,500,000. Fourteen projects had two participants each, while the Strategic Highway Research Program (SHRP) Implementation Asphalt Test Equipment Project (SPR–2(800)) had the greatest number of participants, at 47. Its objective was to acquire the SHRP-related asphalt testing equipment for State DOTs. Although there is no such thing as a "typical" TPF project, the average project had nine participants and was valued at $466,003. Research studies on pavement and asphalt programs account for 24 percent of pooled fund studies. The second largest percentage of studies, at 17 percent, involve innovation and technology transfer activities. In many cases, the pooled fund process provides an excellent mechanism to promote new technology. Technology transfer covers activities that lead to adoption of a new technique or product. It involves dissemination, demonstration, training, and other activities that lead to eventual innovation. The TPF Program encourages States to include technology transfer activities in all pooled fund studies, but some projects focus solely on technology transfer. The WASHTO-X Technology Transfer Initiative (TPF–5(017)) is an example of a TPF project to facilitate technology transfer. FHWA and States participating in the initiative use videoconferencing to share information about new technologies through demonstrations, training, and roundtable discussions. From May 2002 to May 2003, the initiative conducted 20 events on topics ranging from highway noise abatement to bridge foundations and scour mitigation. Most of the teleconferences are available at the WASHTO-X Web site at www.washto-x.org/overview.html. The Full-Scale Accelerated Performance Testing for Superpave® and Structural Validation Project (TPF–5(019)) is an example of an FHWA-led TPF study with 11 State DOT partners. The experiment focuses on developing field performance data on hot-mix asphalt mixtures with modified binders. This is an important step in a larger program to refine the Superpave binder Figure 1. Pavement Testing Facility at TFHRC specification for the modified materials. 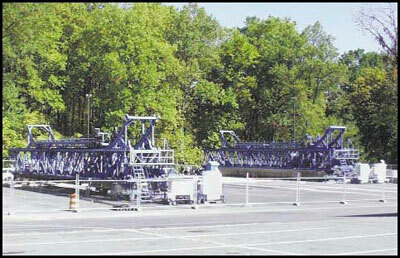 Secondary goals include early trials of the proposed American Association of State Highway and Transportation Officials (AASHTO) Guide for Design of New and Rehabilitated Pavement Structures, evaluation of crumb-rubber modified asphalt pavements, and correlation of field performance with results of laboratory tests such as the Superpave simple performance test. Federal agencies other than FHWA sometimes participate in TPF studies. One is the Frost Effects Research Facility (FERF) at the U.S. Army Engineer Research and Development Center’s Cold Regions Research and Engineering Laboratory in New Hampshire, which permits full-scale, controlled-environment tests year round. One TPF project underway at FERF is the Pavement Subgrade Performance Study (SPR–2(208)). The study hypothesis is that the criterion for pavement failure depends on the subgrade soil type and the in situ moisture content. Many current mechanistic design procedures incorporate results from the AASHTO road tests conducted in the late 1950s. As a result, the failure criterion is based on one soil type (A-6), and it is difficult to discern the effect of load and environment on the criterion. As part of the TPF project, researchers selected four subgrade soils to test in the FERF, each at three different moisture contents. They are subjecting the test sections to accelerated loading under controlled environmental conditions and evaluating the results. In the early years of the TPF Program, projects were designated as "regional" or "national" in scope. As part of the 1999 reengineering effort, the program eliminated those labels. Projects are now referred to as FHWA-led or State-led studies. Pavement Study Test Site in Alabama. In the study, 45 61-meter (200-foot) sections of flexible pavements were installed at a 2.7-kilometer (1.7-mile) test track, using a variety of materials and methods unique to section sponsors. 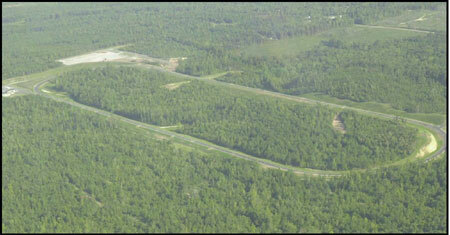 The National Center for Asphalt Testing then simulated 10 to 15 years of truck traffic in a 2-year period. This facility is expected to clarify the relationship between methods and performance so that future design and construction policy can be objectively guided by life cycle costs. The Rapid Bridge Replacement Techniques Study (TPF–5(055)), a non-regional effort led by the Texas DOT, brought together the States of Texas, Georgia, and Illinois. These geographically diverse States pooled their funds to research and identify the optimum combinations of materials and techniques to rapidly repair or replace damaged bridges. In addition to bringing States together, many TPF projects involve colleges and universities. The University of Nebraska–Lincoln is home to the Midwest Roadside Safety Facility (MwRSF), an organization that researches all aspects of highway design and safety. MwRSF conducts safety performance evaluations of various roadside appurtenances, and develops innovative design concepts and technologies in the highway safety area. 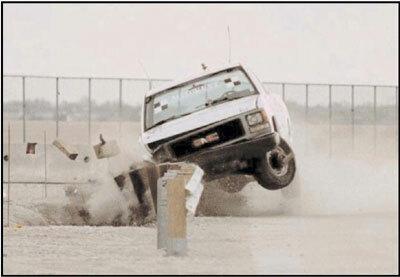 For the Midwest States Pooled Fund Crash Test Program (SPR-3(017)), the MwRSF crash tests highway roadside appurtenances to ensure that they meet national criteria. Although the project was proposed originally as a Midwest study, partners include Connecticut, Florida, and Montana. The TPF Program is distinctive in that it allows entities outside the United States to participate. The most frequent non-U.S. participants are Canadian cities and Provinces. For instance, the Reinstatement of Utility Cuts Project (SPR-3(080)) included the cities of Calgary, Edmonton, Ottawa, and Vancouver. The ENTERPRISE Project (SPR–3(020)), which is studying issues related to Intelligent Transportation Systems (ITS), includes nine States, FHWA, Maricopa County, AZ, (which participates through the Arizona DOT), Transport Canada, the Ministry of Transportation of Ontario, and the Dutch Ministry of Transport. Other European countries, as well as Japanese companies, have expressed interest in the project but are not official partners. Computer-aided dispatch and traffic management center integration. Automated carpool occupancy detection systems for high-occupancy vehicle lane operations. Benefits of ITS in rural transit. The TPF Program supports participation for entities below the State level, such as cities, counties, and metropolitan planning organizations. For example, Maricopa County, AZ, participates in the ENTERPRISE Project, and many cities were involved in the Reinstatement of Utility Cuts Project. The program also provides a mechanism for public-private partnerships. Several private gas and electric companies, and a cable television company were involved in the Reinstatement of Utility Cuts Project. Participation by foreign governments, local governments, and the private sector in a pooled fund study is at the discretion of the lead State. Traveler opinion and perception survey. Guidelines for designing bridge piers and abutments to withstand collisions. Expanded study on fish passage through culverts. These and other projects will continue the TPF legacy of leveraging resources to improve transportation. For more information, visit the TPF Web site at www.pooledfund.org.